I haven't made a habit of doing this, but am thinking maybe I should start. We are allegedly on vacation, as our schoolyear officially runs from January to October. This year has been a bit strange, though, so we are forced to do some "summer school" and of course, my Review Crew responsibilities mean we need to continue some of those things too. Plus, this week, Dale is home. However, there are some things that do have to happen. Illuminations: finish Week 6: that means one Mystery of History lesson, a couple chapters of Exodus, half of Tirzah, a couple stories from While Standing on One Foot, start Cat of Bubastes, one lesson of Winston Grammar, and some geography. Mathletics: everyone has a subscription for the crew through mid-December. Everyone needs to get on and do at least something every day. Kinderbach: the big guys are actually doing the teaching on this one. Maestro Classics: another Review Crew item - I want them to listen to the CD again at some point this week. Some science stuff too. But they don't think of that as school either. Illuminations: finish Week 6: that means finish the book Genesis: Finding Our Roots. Sonlight 6: continue reading the history material at a slower pace. I think this week it's just a chapter of Story of the World. Latin 100: class on Tuesday, whatever homework is assigned. Work on his commercial about visiting ancient Rome. CyberEd Science - Physical Science: our subscription ends on the 7th, so he has to continue if he wants to finish it. Scouts - he is planning to get a speech about tornadoes prepared, plus some other misc. merit badge stuff. And we need to go visit a criminal court trial. Illuminations: finish Week 6: that means a couple days of copywork. Scouts - visit a criminal court trial also. Work on Second Class first aid skills. He'll continue to read to me. It looks like a lot all written out. But most of the stuff is not going to take long, or I really don't have a choice. Connor has it the worst. I'll have to see if there is something I can do to ease that up a bit, but aside from not letting him program computer games, I'm not sure what else I can drop. Lots of little tidbits here. I started working out again. I have to do something about this. I'm always tired, and I'm sick of nothing fitting. I'm sick of being embarrassed to have my picture taken. I'm doing T-Tapp More right now... I did do it for six days in a row a couple weeks ago, but my mother-in-law visiting ended up throwing that off. I'm starting over today. I'm supposed to do 14 days in a row, then go to every other day for eight weeks. That means William's birthday is my first day off. I think I can, I think I can... of course, part of me also knows I probably should be doing something else. Like the regular T-Tapp. Or getting my Firm workouts out again. Paperbackswap and swapadvd are amazing. This Christmas would be scary without them. I just received Usborne Introduction to Art and The Weather Book this weekend. I have a few Hermie and Friends DVDs in a pile for gifts. A is for Adam is on its way... I also have Uncle Wiggly's Story Book sitting here waiting too. I have no idea how we'd school this year without some of what we've received through these guys. If you aren't a member, sign up... and if you don't have someone else already encouraging you to do it, feel free to use my email as a referrer... dkbrinkman at yahoo dot com. Or don't. We always seem to have the credits when we need them. I went to a gardening seminar this weekend while the guys were in the merit badge college. We'll be meeting monthly (not in December though), and the classes are free as long as we sign a pledge that we will grow or purchase locally grown to cover 20% of our produce needs next year. Eeek! I think I can, I think I can... Great session, I'm glad I went. We have homework... I have to do a sun survey, which should be pretty funny (uhhh, let's see, virtually everywhere on our property is getting full sun at 8:00, 12:00 and 4:00). I have to make some decisions about how big a garden I'll do next year, I need to start composting, and I need to at least be thinking about starting to build/prepare/etc. You will see more on this subject... If you garden, I'd love to hear your responses to some of what I'm up to as the year progresses. If you don't garden, I'd still love input. And then there are the little two. I've had Richard (age 5) working on a kindergarten math program. I knew it would be on the easy side. I didn't know he'd blow through the whole thing in about four hours. And more importantly, I didn't know that Trina would already know 3/4 of it. I have to get more serious about school for my little two. They are making it clear to me lately that I'm not challenging them either. Okay, so I better stop rambling and start getting something accomplished today. Prior to joining the Homeschool Crew, I had never heard of Exploramania and GyMathtics. The idea sounded intriguing, though, and I hoped to be selected to review the product. 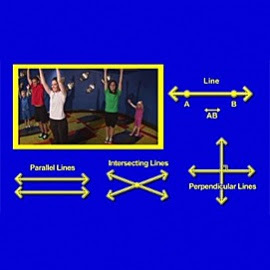 Basically, GyMathtics is a kids' workout DVD that also incorporates math facts and healthy lifestyle concepts. Many of the kids' workout DVDs we own do the healthy lifestyle part, but math? That's new and different. 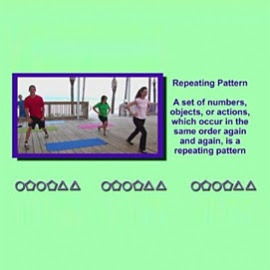 They bill this as a workout appropriate for kids of all ages, and the kids in the video do represent a range of ages. There is an adorable little girl who looks to be about five. There is a boy who is around 10 years old. And there are two teens, a boy and a girl. Katrina absolutely adores the "little pink girl" and refuses to do the one segment that she isn't in. My boys all like the teen boy, and while there were a few moments where the bigger guys thought this whole workout was a bit silly, looking at this older teenaged boy working out without rolling his eyes or anything convinced them to continue. Richard, my 5 year old, thought the 10 year old boy was pretty cool too. What about the math? It is meant to be reviewing concepts covered in 2nd-5th grade, and that seems to be pretty accurate. The first segment is the stretch. I thought she did a really good job of introducing geometry by doing things like stretching with straight arms above the head and down. The stretch section incorporates lots of geometry - rays, angles, lines, circles, and more. The next section is calisthenics, where you are counting in various ways -- odds, evens, skip counting, prime numbers, and so on. 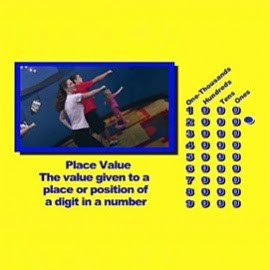 When doing place value, there is text on screen that defines what place value is. There is similar text for many of the concepts. This section is aerobic, having the kids jogging, lifting their knees, and doing jumping jacks. The third section is on patterns, and would be the strength training portion. Trina refuses to do this, as the "little pink girl" isn't doing it. This part has you doing things like a repeating pattern of pushups, Superman, swimming, and crunches. The final section is the "well-being wind-down" which is a final stretch. This section does not have any math. As you do things like shoulder rolls and various stretches, a voice over tells you things like "Try to get a good night's sleep every night." What we liked: I loved that there were a range of ages included. That makes it much better for my kids, as they all had someone to watch. The workout is a good, basic and balanced one, which doesn't include fancy choreography. The participants are all dressed in normal looking clothing, not fancy expensive "workout gear" or overly coordinated duds. Everyone looks like real people too, which is always a plus in a workout video. I love that they are reviewing math. The first time through, some of the math parts seemed a little forced, but not so much on later viewings. What we didn't like: well, the high fives in the aerobic section got a bit much for me. The kids liked it though, and I guess that is what matters. The workout was not as strenuous as some of the kids' workouts we own, so I wouldn't want this to be our only workout DVD. GyMathtics is available on DVD for $24.99, and a second volume is coming soon. Volume 2 targets a slightly higher age for the math, 4th to 7th grade, including Algebra Aerobics. I will be watching for this to come out, and it is something I will consider purchasing. Disclaimer: As part of the TOS Homeschool Review Crew, I did receive GyMathtics for free from Exploramania. The fact that I received a complimentary product does not guarantee a favorable review. It does guarantee a review. A fair review. But I am not going to praise something unless I think it deserves the praise. If I don't like it, you'll hear that. And hopefully with enough detail as to why so you can decide for yourself if what I hate about it makes it perfect for your family. For more about my take on reviews, visit my blog post here. So, Saturday dawned with us (Connor, William, and myself) on our way into town to attend a Merit Badge College sponsored by Troop 53 at Coronado High School. With the miserable weather, we arrived a bit late, but not terribly... just a couple minutes into the announcements. We were far from the last people to arrive. But, to back it up a bit... the kids signed up for this event and got their first choice sessions. That meant in the morning session, Connor would be working on his Weather Merit Badge, and William would be working on Photography. In the afternoon session, they were together for a session that would include both Crime Prevention and Fingerprinting. We weren't able to get the merit badge books until Monday, and at that point, Crime Prevention was sold out. We found an old copy at the library, however, so we were able to get somewhat prepared. 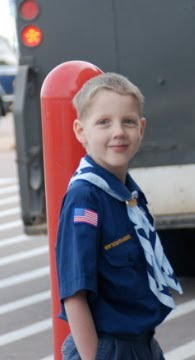 Since this was to be William's first Boy Scout event other than a troop meeting, and with his dyslexia and such, we ended up pretty much dropping school for the week and focusing on merit badges. That meant we spent a lot of time this week discussing drugs and gangs. We did a lot of combing the newspaper for crime and crime prevention stories. We discussed AFIS and papillary ridges. We discussed f-stops, aperature, and the pros and cons of film and digital cameras. Fortunately, Connor was able to do the prep for Weather on his own, because I don't think I could have taken another merit badge this week. It was a lot harder than I expected to get William to his first session and to LEAVE him there. I did not want to do it. I just felt like I was abandoning him. What if they make him read? What if he isn't prepared? Of course, he did great. He walked out of the morning session having earned his very first merit badge. He had a ball, he loved the session. Connor had a good time in the weather session too. But since he hasn't had a chance to give a 5 minute speech on what to do in a tornado (or something like that), he didn't quite get the merit badge earned. He did, however, meet another homeschooled scout. I have to tell you about that experience. The abbreviated version is that the weatherman was talking about global warming, and making the point that it is "just a theory" and we haven't proven it is really a problem. That we've only been recording temperature data for about 100 years of the earth's few billion year history. Connor raised his hand and asked, "Isn't the whole billions of years things 'just a theory' too?" It was acknowledged that it was. Connor went on to say something like, "Your point is still a good one, even for those of us who believe that God created the earth roughly 6,000 years ago. We've still only been collecting temperature data for a mere 100-ish of those 6,000 years, which certainly isn't a big enough perspective to draw the conclusions that so many people do." It was acknowledged that evolution and an old earth were also not proven. Can you believe it? I never, ever, ever would have dared to say something like that to a grown-up when I was his age. Of course, when I was his age, I had never, ever, ever heard anyone postulate that the earth was only around 6,000 years old. Anyway, after the session, another scout came up to him and told him how much he appreciated how Connor stood up for his faith, and added "I'm homeschooled too." Connor looked at him funny, and the boy added, "You are homeschooled, aren't you?" Connor replied that he was, and the other boy said, "It takes one to know one." They proceeded to go get lunch and sit together to eat. What a great kid. All in all, a great day. The sponsoring troop did a fantastic job with this merit badge event, and I will certainly be willing to bring the kids again if they do it next year! AVKO Foundation, probably best known as the Sequential Spelling people, exists to provide free and low cost materials to all educators in an effort to provide literacy to everyone. As part of The Old Schoolhouse Homeschool Crew, I was given a one year membership to their site. And I was really excited to get it. I have tried Sequential Spelling in the past with my oldest son. We found it frustrating, mostly because he just did not have the stamina to write out 25 words a day at that time. The one thing he did learn from that experience was something I didn't know that he didn't know: that there IS one right way to spell a word. I was really interested to see what a membership could do for us, and I have had fun poking around on the website. I'll start with a couple of the negatives: the site is a bit overwhelming and confusing, and it definitely takes a chunk of time to sort through it. In the free e-books section, you can download pdf versions of a number of AVKO products. I'll use the numbers for these titles later in this post too. This section also includes a subsection on Instructional Ideas. I think this part gets lost among all the humor links. The instructional ideas links include a page on how to create a customized "sequential spelling" program, along with things like tutor certification tests, syllable rules, and more humor. The last section is the Supplemental Curriculum section, which also has subsections. The first area includes links to word searches for Sequential Spelling users, but also some fantastic vocabulary cards that certainly are not tied to any specific program, and links to websites for idioms, vocabulary and proverbs. In addition to access to the members only page, you also get a 25% discount on all printed materials from AVKO. Okay, so what did I think? I love this site, and I am thrilled to have a membership. For me, it is well worth the effort to figure out where things are. I have been reading To Teach a Dyslexic (free e-book #3), which is essentially an autobiography by Don McCabe. I started using Starting at Square One (free e-book #5) with Richard, and it just clicks for him so well. I want to use the Continuum book (free e-book #4) with, well, probably everybody, but I haven't had enough time to really figure out how to make that happen. And I used the information in the webpage about customizing Sequential Spelling to start Connor with a new spelling approach. This uses The Patterns of English Spelling (free e-book #2) to work on specific word families -- using only the spelling patterns that I see that he needs to use. Being able to print up the Student Response Forms (free e-book #7) is nice, but not necessary. I also listened to all of the seminars. I would recommend that if you do purchase a membership that you do space that out and not listen to them all one right after another. He uses a lot of the same examples, and I think I would have gotten a lot more out of these had I spread it out to listen to one every couple of weeks. But listening to one of his seminar recordings would be a great place to start if you do purchase a membership. Which one? I couldn't say... whichever title grabs YOU. Do I recommend this membership? Well, I guess that depends. For $25, you do receive a lot of material. But if you have children who have naturally picked up reading, and are fantastic spellers, this site is probably not for you -- unless they are fantastic enough to be trying for the National Spelling Bee, in which case, the free ebooks #1 and #2 might be excellent resources (and it is less expensive to buy a membership than it is to purchase those books individually). If you have a child who is making solid progress in reading and spelling with what you are already using, there may not be enough here to be worth it either. If, however, you are using Sequential Spelling, a membership is probably worthwhile, as you can purchase the books at a discount, and get a lot of other things to help you stay motivated or to remember why you like this program, along with actual supplemental resources to use with the program. Or if you have children who show dyslexic tendencies, you may want to seriously consider an AVKO membership. Since I have at least one dyslexic child (and at least two others who have exhibited some typically dyslexic traits), I definitely find value in this website. Even if all I used were the six mp3 recordings and reading the autobiography, I think that alone would have been worth the membership price to me. Disclaimer: As part of the TOS Homeschool Review Crew, I did receive a one-year membership on the AVKO website for free from the vendor in question. The fact that I received a complimentary product does not guarantee a favorable review. It does guarantee a review. A fair review. But I am not going to praise something unless I think it deserves the praise. If I don't like it, you'll hear that. And hopefully with enough detail as to why so you can decide for yourself if what I hate about it makes it perfect for your family. For more about my take on reviews, visit my blog post here. Not that I expect many of them are reading my blog. Dale does sometimes. If anyone else does, I'd love to know! So, living near a very military town, as evidenced by the above photo, one thing we have is a terrific Veteran's Day parade. My oldest three marched in it this year, and as my tribute to veterans through the years, here are a few photos. For the record, the loudest cheers were for each and every one of the groups of active military that marched by, and there were lots of them. Ol' Blood 'n Guts, but hopefully you knew that. Someone in the crowd yelled, "Give 'em hell, George!" as he went by. My Cub Scout is in that mass of kids. He's the furthest kid to the right. And the best for last... I sure hope we have a few more parades for this car. What a great parade. And so well deserved. Thanks ever so much, to all the veterans, to all the current military members... and to those who are more likely to be reading these words -- their wives and families. I'll be linking other great photos from this parade later. Dale's working on that. Okay, I'm back-dating this post. I confess. My eight year old is now a nine year old. EEK!! Where did the time go? Only yesterday, I was sitting up far, far too late in the night, watching election returns to find out who our next president would be, knowing I had an OB appointment the next day (11/8) and I really should go to bed. And so I finally did. And in the morning, we still didn't have a president-elect. And my OB was concerned about me when I did get there, and rescheduled my c-section to the next day. I was relieved to not be taken directly to the hospital, do not pass GO, do not collect $200 (my first two were emergency c-sections). And so I forgot, sort of, about the drama going on in national politics. A friend volunteered to take my "big" two boys (they were 3.5 and almost 2, hardly seems big now) the next morning. And as Dale and I drove to the hospital at 'oh way too early thirty' we listened to the news, and still didn't know who our next president would be. On the operating table, among talk of what to do to perform the c-section, the doctors and nurses talked mostly about Bush and Gore. And in recovery, the nurses were mostly talking politics as well. But by then, I was far more focused on getting to my real room so that my very first non-NICU baby could be brought in to me. Wasn't that all just yesterday? Last week? Certainly it can't be more than a year or two? And now... now I have this big boy who insists that he is actually nine years old. He spent his birthday doing things like taking out the trash without being asked, and pushing a cart in the grocery store, and looking over some toys at Walmart in order to plot out what to purchase for his siblings for Christmas, and becoming the Denner in his Cub Scout Bear den, and sitting -- and LEARNING -- through a presentation by an EMT on first aid and emergency situations. Not only that, but he purchased a candy bar with his own money, and split it into seven pieces -- even though only four of us were there when he bought it -- and gave everyone a part. His was only slightly bigger than the rest. He was also able to perfectly recite the Boy Scout Law (he doesn't need to memorize that for another two years) *and* explain how he is living it out. When Grandma's dog chewed up his favorite matchbox tank (one of his birthday presents), he did a fantastic job of comforting her (she felt just terrible about it). He is planning a (very small) birthday party. He's never had a party with friends. And his focus in doing this? He is so very excited about putting together the perfect little goody bags for his friends. He says he doesn't care if they bring him presents, he just wants to hang out with them a bit, and give away the treats. And he told me that it is okay if I don't give him any presents, just putting together whatever we can for an inexpensive party is enough. And to think this is the child who a few hours, uhhh, years ago had us convinced he was going to be living in the penitentiary when he grew up. Thomas, hon, I am so enjoying watching the man you will become as he starts to emerge from that precious little bundle I held nine years ago. I am so very proud of you sweetie. I blogged a couple weeks ago about how I am using Cub & Boy Scouts citizenship materials as a spine for some of the subjects required by Colorado that I don't necessarily want to make into a full-blown study. Namely Civics and Constitution of the United States. Well, I have another option now. 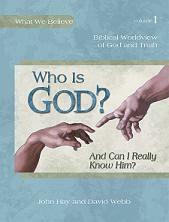 As part of the Homeschool Crew, I received a CD from American Heritage Education Foundation. I've looked at their materials in the past, but never enough to really get a handle on what is included. And what I've glanced over looked way too classroom oriented for my tastes. I really should have looked further, as there is a lot of great information here, at least for homeschoolers in the US. American Heritage Education Foundation is "dedicated to the understanding and teaching of America's factual and philosophical heritage to promote constructive citizenship and Freedom, Unity, Progress, and Responsibility among our students and citizens." Those four themes are explored over the course of approximately fifteen lessons. The idea is to do one or two lessons per month over the school year. Some lessons can be completed in 45 minutes (their time recommendations), some are meant to be worked on over a few "class periods." They have four separate products: lessons for elementary children, a Spanish version of the elementary level, lessons for middle schoolers, and lessons for high schoolers. I only glanced at the high school lessons, and opted to combine the elementary and middle school levels. Many of the lessons are very similar (about ten of them) and those can be taught together, with the older students doing more involved projects or writing more. About 1/3 of the lessons are different enough to not readily combine. I haven't gotten to those yet, so I haven't quite decided what I'm going to do with them. They have suggestions for when to do the lessons (by month), but as far as I can tell the only lesson that really is month-sensitive would be the lesson on Thanksgiving. So I am just working through the materials from the beginning at a rate of a lesson every 2-3 weeks. I'll skip ahead and do the Thanksgiving one in a couple of weeks, then jump back to do them in order. What I like: this is a really painless way for me to log some time in for civics. And I love the focus on the themes. We're studying Ancient History this year, so getting a periodic refresher on American history is kind of fun. We're reading quotes from Thomas Jefferson and Thomas Paine, George Washington and George Carlin. Okay, the Carlin quote wasn't actually in the materials... that was one my oldest found as he was doing some research on the theme of Freedom. (I know you'll ask... "If crime fighters fight crime and fire fighters fight fire, what do freedom fighters fight?") We're taking a look at the causes of the American Revolution from a lot of different points of view (King, Parliament, Governor, Soldier, Merchant, Colonist). What I love: the price! It's free!! You can either download it, or they will mail a CD that contains all four sets of plans. Or, you can order a printed version for $19.50 per level. See the website for details. I'm glad we started doing this. Disclaimer: As part of the TOS Homeschool Review Crew, I did receive this product for free from American Heritage Education Foundation, just like anyone else can just by requesting it. The fact that I received a complimentary product does not guarantee a favorable review. It does guarantee a review. A fair review. But I am not going to praise something unless I think it deserves the praise. If I don't like it, you'll hear that. And hopefully with enough detail as to why so you can decide for yourself if what I hate about it makes it perfect for your family. For more about my take on reviews, visit my blog post here. Okay, this is just too good to pass up! 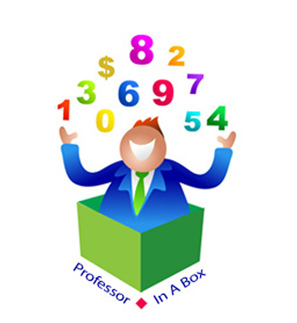 Check out American Math Challenge if you have children aged nine to fourteen. You can have free access to the Mathletics website this week and next, though from what I can tell, it isn't quite as nice as the full Mathletics site. Close though. The kids do need to be able to read the math problems, or have you nearby. Fortunately for me, my guys have gotten to the point that they can all handle most of it on their own. There are prizes for the top 10 students. I doubt my kids are going to be trying for that, but still... this is a website I've looked at frequently and wanted to try. At $60 per year per kid for a subscription, it isn't something I can afford to "just try," so a chance for my kids to use it for almost two weeks for free, yeah, I'm on it. And I have to say... I'm starting to think that a real subscription might need to be figured out for at least a couple of my kids. I just listened to a radio show where they interviewed someone about homeschooling in the real world. And while I like hearing about how well homeschooled students are doing in college, or how well they are doing academically, or whatever... something was really bothering me. I went to workout, and the show was niggling at me the entire time. And I think I figured out what is bugging me. I am tired of all the "experts" in homeschooling, at least from the 'who do we call to do a segment on homeschooling' standpoint, being people who aren't actually DOING the homeschooling themselves. And that they don't acknowledge that part of it. While it is nice to hear a media situation putting a positive spotlight on homeschooling, it just seemed so, so, so, uhhh, perfect. You know, 'the classroom teacher can just lose track of a couple of the quieter kids, and that would never happen in a homeschool where Mom is your teacher,' and that kind of thing. Ummm. Okay, confession time. Maybe I'm just an awful person, and a horribly unorganized and negligent homeschooling mama. But I will get to the end of the day and realize that I never sat down with a particular child that day, and even though I resolve to do better tomorrow, sometimes I realize it has been three weeks since I've done a spelling lesson with a certain kid. Middle child syndrome has been alive and well for years. I know I didn't invent it. Or I'll assume, since he isn't asking me for help, that my oldest is actually completing his homework for his online Latin class. Only to discover, when the grades come out after the first big test, that he isn't. Or it will occur to me that I really ought to be teaching my kindergartner to read. Oops. And when I sit down to do it, I realize he has just "caught" it and I don't have to teach it. But it doesn't mean he shouldn't be getting one-on-one time from me in SOMETHING. Listening to this interview depressed me. It made me feel inadequate. These two men are talking about all the bliss of family togetherness, and how easy it is to homeschool. One statement in there was something about once the kids are high school age, you are just an audience. Mom doesn't even need to know the subject herself, she merely needs to be available to listen and watch. Uh, hello???? Is that before or after I watch the soap operas and eat bonbons? I guess I just felt devalued. You know, pick out the right curriculum and everything is fun and easy and my children will be brilliant. He did, I admit, make a statement at some point about homeschooling being a lot of work, but mostly he talked about all the bliss. Don't get me wrong. I love what I do. I can't imagine not homeschooling. But there's a lot more to it than just following a curriculum. I do think that any parent who truly wants to homeschool their children can do it. But there is a lot of agonizing over what a particular child needs, and struggling to balance family needs (like groceries) with homeschooling wants on one income. I know I'm not the only homeschooling mom who wonders if she is totally screwing up her kids. Maybe part of it goes back to an article I read recently by Sarita Holzmann. Or maybe it has to do with receiving another mailing yesterday from CHEC and being reminded of how paternalistic my state homeschool organization is and how frustrated I get whenever I hear anything from them. Or how many of the "big" speakers at homeschool conventions aren't the ones doing the homeschooling either. Or maybe they are homeschooling one of their children (the teenaged boy) or one subject -- so now they definitely feel they are experts. Rarely are they the ones teaching Algebra 2 *and* changing diapers. I think I need to be more picky about what I listen to. And realize that for the audience this broadcast has, this was probably an excellent show. I should celebrate that homeschooling is getting a positive spin in some media outlets. And I should probably stick to listening to imperfect people who don't make me feel like a failure, and who can help me find the next toehold on this homeschooling cliff. From the perspective of someone who is climbing too, not someone who has merely watched other people do it. And I figure I'm going to regret posting this. When I applied for a spot on The Old Schoolhouse Homeschool Crew, I never imagined what a workout my oldest was going to get as far as planning for the future. He's done high school, college and career planning. He's done SAT prep. And now, thanks to Act, Advantage, he is doing more career planning, and preparing for the ACT. This review is about Discover Career Planning, an online career planning site that is subscription based. You start out by taking 2-3 assessments, depending on your age. I'm sure it will be no shock to any of my regular readers to learn what Discover recommended for career areas for my oldest son. Well, okay, the Crafts and related category stumped me. But the other five all work for him. The last three are the best fits. He was able to print off a stack of information about a variety of careers. From the above sample, you can see that they do cover a variety of information. What has been wonderfully fun about having this subscription is that we are able to research all kinds of careers really easily. For scouts, many of the merit badges require the kids to investigate careers in a certain field. We have used this site to investigate careers in art, in environmental science, in cooking, in engineering, and I'm probably missing some others. We have loved having this subscription. The information is logically presented, and it is easy to explore job options that are available with varying levels of education. A 3 month subscription to Discover costs $20, or you can get 6 months for $25. This also includes a High School Curriculum Guide, which looks fantastic. And 260 pages! We didn't really use it (yet) though, as Connor was cruising along just exploring the website. I did find many of the suggestions in there to be great though. Definitely geared to the classroom, but pretty easy to adapt. There are some fantastic activities included. Some of my favorites included a career family tree, an exercise to compare and contrast careers, and the high school planning ideas. What I would like to do in the future with this is to purchase a subscription at least once for each of my children. Sometime in junior high, probably 8th grade. Have them work through the inventories, and follow up on the career areas mentioned, and use the Curriculum Guide to help formulate a plan for high school. I may consider purchasing a subscription again when they are nearing the end of their junior year, or otherwise starting to get fairly serious about "what next?" in their journey. I think this product is well worth the money. Disclaimer: As part of the TOS Homeschool Review Crew, I did receive a free subscription to Discover Career Planning from the ACT Advantage. The fact that I received a complimentary product does not guarantee a favorable review. It does guarantee a review. A fair review. But I am not going to praise something unless I think it deserves the praise. If I don't like it, you'll hear that. And hopefully with enough detail as to why so you can decide for yourself if what I hate about it makes it perfect for your family. For more about my take on reviews, visit my blog post here.